Commemorate one of the most iconic metal bands of all time with this amazing artwork based on Iron Maiden's The Book of Souls Album! 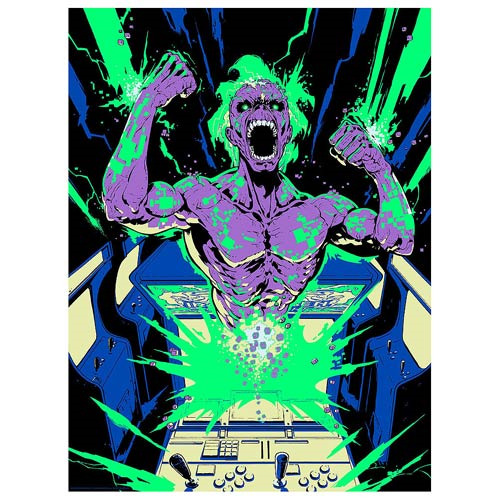 Based on Iron Maiden's single, "Speed of Light," this Iron Maiden Speed of Light by Santi Casas Silk Screen Art Print features a stunning image of an electric Eddie bursting forth from an arcade game cabinet. A limited edition of 250 pieces measuring 24-inches tall x 18-inches wide, this beautiful piece of art even includes artist Santi Casas' signature and has been printed using fluorescent ink!